After saying ‘yes’, it’s time to think about all the details before you actually say ‘I do’. Weddings are amazing, but incredibly challenging to organize, so it doesn’t come as a surprise that a lot of couples choose to have a smaller ceremony in an exotic destination. If getting married on a beach is your dream, we’re here to help you out by listing top 5 most wonderful and popular beach wedding destinations in the world. 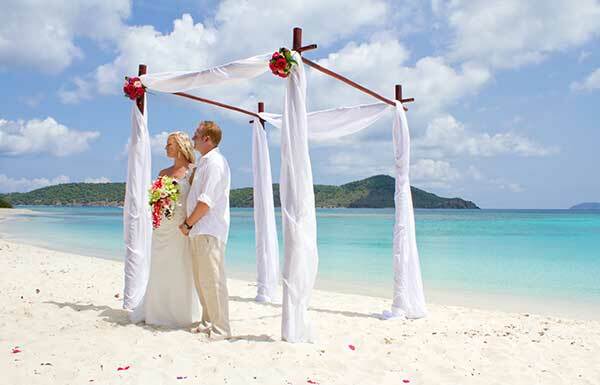 Even though it takes about seven days from the day you hand in your paperwork to the day that you can actually get married, people choose to get married on the Virgin Islands for several reasons: they can use this time as a part of their honeymoon and prepare for the ceremony itself. There are three major islands to choose from, but by far the most popular (and arguably the most beautiful one) is the island of St. Thomas, St. John. For those of you who love novelty, there are many opportunities: an underwater wedding or charter a yacht which your entire party can sail on. Fiji is an incredibly popular wedding destination because of its unique charm: not only is it exotic and has spectacular views, but it has that unique aura of a castaway-island that makes you feel like you’re the only people on Earth. It has a gentle culture and no matter where you’re from, you’ll feel welcome and accepted there. Couples who are looking for an unusual place for an unusual wedding will love Fiji and its exotic ways: ceremonial dances in costumes are common and the bride can be ‘delivered’ in a boat. For those of you who would like to have a beach wedding but don’t want to venture too far from the civilization, Australia is a great choice. The Northern Beaches are located less than an hour away from Sydney, and there you have plenty of venues to choose from for spectacular beach weddings that offer amazing views of the peninsula. There are different places you can get married at, from beaches to golf clubs, and you can easily find something you’ll like that will be private and secluded, yet modern and comfortable. Speaking of beach weddings that aren’t too far from the cities, Istria has you covered. Istria has beautiful landscapes, plenty of secluded beaches, small medieval towns, and even ancient, hidden households for you to choose from. You will find yourself in a fairy-tale environment of a small beach, or you can enjoy the glamour of five-star hotels and restaurants. Picturesque landscapes and plenty of sun are perfect conditions for dreamy beach weddings. The Hawaiian Islands are beautiful: all those pristine beaches, huge mountains, clear water, and exhilarating cliffs make it really difficult to choose a single destination as the most beautiful one. While it’s a long way to go to Hawaii, a lot of couples don’t hesitate to arrange getting married there since it’s a truly memorable destination. Honolulu still stands out as the most popular place to get married, as it’s surrounded by waterfalls, has a lagoon and even a small wedding chapel. If you and your significant other agree that exchanging vows on a tropical beach sounds inviting, you should start planning ahead. Planning a wedding away from your home is difficult, but it will be incredibly exciting. It will also be a symbolic beginning of your new life together. Do your research, browse popular beach wedding destinations and start planning together.